International Conference on Sustainable Agriculture and Bioeconomy 2017, 27 February-2 March 2017. 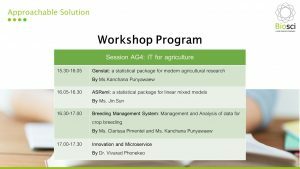 We would like to take this opportunity to cordially invite you to attend the “Data management and processing workshop with Biosci solutions” in the IT for agriculture session. Place: room Nile 4, 2nd floor, BITEC Bangna, Bangkok. Time: 3.30 – 5. 30 pm.